Click the button below to add the Deflect O (120 Capsules) to your wish list. Deflect® O is a unique dietary supplement which has been designed to block problematic food lectins known to interact with blood type O. Dietary lectins can bind to the blood type receptors in the gut and immune system and compromise the intestinal tract, inhibit healthy metabolism and disrupt the immune system. Minimise inappropriate lectin activity by eating foods from the beneficial and neutral list for your blood type O and supplement with Dr. D'Adamo's revolutionary Deflect® O formula. 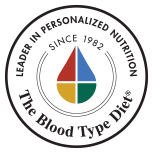 Since each blood type is susceptible to different lectins, Dr. D'Adamo has designed formulas specific to each blood type. The Deflect® O formula has been optimised for use by Blood Type O individuals. Ingredients: N-Acetyl D-Glucosamine, Sodium Alginate, Bladderwrack Seaweed Whole Plant (Fucus vesiculosus), Larch Arabinogalactan, Gum Tragacanth, N-Acetyl Cysteine, Vegetable Cellulose, Organic Rice Extract, Organic Rice Concentrate. Contains Crustacean from N-Acetyl D-Glucosamine (isolated from crab shell).